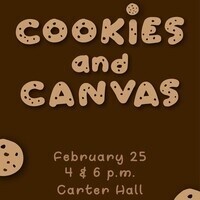 Come grab a canvas and some yummy cookies and paint a masterpiece! Come early because there will be limited seating. There will be two sessions, at 4 p.m. and 6 p.m.